This first novel by the prominent Mexican journalist, editor, and author Héctor Aguilar Camín to be published in the English language, has been acclaimed a classic of contemporary Latin American fiction. Set in Mexico City and the oil-rich coastal regions of southern Mexico, this is a realistic and detailed noir that explores the era of crime and graft in the late 1970s when the land and its people were under siege from the government-controlled cartel PEMEX and the gangsters they hired to lord over their fiefdom. A journalist is plunged into a Mexican "Heart of Darkness," as he must confront both the corrupt government officials and the charismatic yet ruthless crime boss, Lacho Pizarro, in his search for the truth behind the murder of his best friend and husband of the woman with whom he is carrying on a torrid yet doomed affair. "Death in Veracruz is a marvel, the book provides us with lyric density we only find in genius. I will immediately read everything he has written." 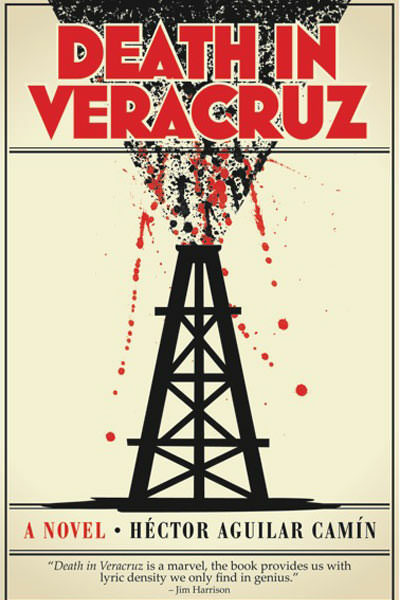 "Death in Veracruz is not only an extraordinary thriller and love story, but also a heartbreaking critique of Mexican corruption, as relevant today, alas, as it was when it was first published..."
"Death in Veracruz is a Byzantine knot of friendship, betrayal, love, ambition, politics, money, oil and murder . . . recommended for fans of politics, thrillers, history and Mexico." "This ambitious novel memorably brings together recent history, horrific crimes, and an ever-present sense of corruption." "Mexican author Camín makes his English-language debut with this gritty and convincing...tale of murder and corruption, first published in 1985. Camín's style recalls Robert Stone...he obviously possesses an intimate knowledge of the Mexican"
"I wish 'Speaking of Mysteries' was posting [an] interview with Héctor Aguilar Camín, but I don't speak Spanish. After reading this book, though, I was sorely tempted to learn. I'm taking Spanish lessons in anticipation of Aguilar Camí"
"'Death in Veracruz' , the first novel by Mexican author Héctor Aguilar Camín to be translated into English, [is]...at its heart, the noir romance of one man's unquenched passion for an old college friend's wife."